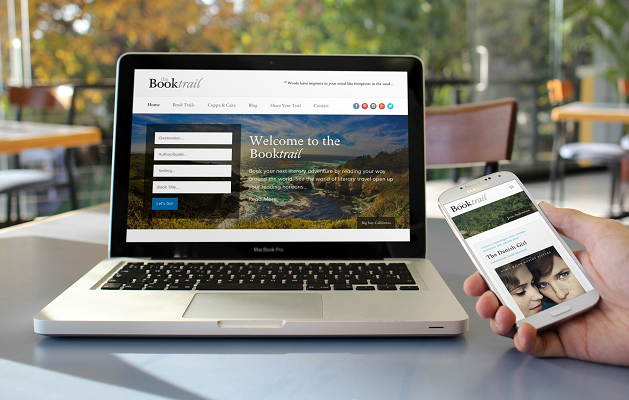 If you’re an avid reader, and can’t help but be caught up in a good tale you might be pleased to learn that we’ve just launched a new website for The Book Trail which will allow you to experience your favourite novels in a whole new way. Reading a good book can be a very immersive experience and sometimes you want to know more about the setting – just a little bit of extra information to help your imagination set the scene. The Book Trail features reviews so comprehensive you could use them as a travel guide, with the novel’s authors as your own personal tour operators. Originally a blog, the concept of the trail has exceeded the expectations of it’s creator, Susan Heads, and proved very popular both in terms of readers and now contributors. She came to us with the idea of moving the site’s design on and increasing usability. We’ve addressed this by freshening up the look and providing a comprehensive search tool that will search by location, author, title or genre. This enables readers approaching the site from different angles to easily find what they’re looking for. The old site held over 100 reviews and, although it took both Susan and some of our team quite some time to get all of the current book trails into the new site, moving forward this will be much faster as she will be able to content manage The Book Trail site herself through WordPress. To make this less time consuming, some of the content is now being pulled through from Amazon and Google Maps. When adding a story the cover image will update in line with the one on Amazon and each book can be purchased through a direct link. Details of a sale will then be automatically tracked in Susan’s Amazon Associates account. We’ve integrated Google Maps and street view to enable users to be able to discover the landmarks featured in a book, along with the precise coordinates of some of the key locations. This adds another dimension to the experience of following a trail, either on location or from the comfort of the sofa. Since relaunching the site Susan has collaborated with publishing houses on competitions, featured on the Chronicle Live site and even appeared on ITV, which is fantastic. All of this bodes very well for the success of the site. We’ve enjoyed working on The Book Trail with Susan and wish her the best of luck in the future. You can read more about the brief and our solutions here. If you’d like to have a chat about working with us on your project, get in touch. We’d love to hear about your venture.